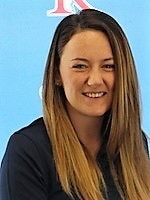 Nicola Robertson from Dunblane, a student at King University, Bristol in Tennessee, finished second in a field of 45 players at the King University Invitational college golf tournament at the Country Club of Bristol, Tennessee. Nicola had scores of 72 and 77 for a total of 149 over a par-71 curse of 5,852yd. She fnished three strokes behind the winner, Elizabeth England (Carson Newman University)who had scores of 72 and 74 for 146. Samantha Taylor from Newcastle, a team-mate of Robertson at King University, scored 74 and 78 for 152.